After the political changes that occurred in countries of the former Eastern Block at the end of 80's, climate change started to be taken into account to some extent at the governmental level. In particular, from the scientific point of view, at the beginning of 90's the access to information and data started to become a reality. Around the mid 90's significant improvements in cooperation were promoted by the US Country Study Programme. Under this framework, many countries from the former Eastern Block obtained access to global climate-change scenarios and longer series of global climatological data. They participated to workshops on the use of this information for the assessment of climate-change impacts on agriculture, forestry, water management and health. Unfortunately, at that time there was very limited equipment to handle large amount of data and, moreover, not sufficient know-how in this region to start real cooperation efforts in the field of climate-change modelling. However, this knowledge gap has been progressively eliminated and when the regional climate model RegCM appeared through ICTP in several countries of Central and Eastern Europe at the end of 90's, it proved the feasibility of carrying out regional climate-change studies performed by local users in this area. Eventually the adaptation of a commonly used NWP model in LACE countries, i.e. the model ALADIN from Météo-France, started in 2001 in Czech Republic and now this model, ALADIN-Climate, has taken part in the EC FP6 project ENSEMBLES. Thus, the door has been opened for real climate change impact and vulnerability assessments for central and eastern Europe based on locally provided high resolution regional climate modelling. During the last decade regional climate models (RCMs) have been increasingly used to examine climate variations at scales that are not resolved by global models. To the extent that they produce realistic climate simulations, such models can be powerful tools in the study of regional climate impacts. Since the field of regional climate prediction is still evolving, the skill of RCMs in simulating climate variability has not been extensively evaluated. This is planned within the framework of the project ENSEMBLES for simulations of 50 to 25 km resolution driven by ERA40 reanalyses. As part of the ENSEMBLES project transient scenario runs of 100 - 150 year's length are also planned under different greenhouse gases (GHG) and aerosol forcing. In this proposal we plan a detailed analysis and use of the results of the project ENSEMBLES for focused initial impact studies in our target region. However, one of the main objectives of this proposal is also to adapt a few of the models used for ENSEMBLES (ALADIN-Climate and RegCM) for very high resolution (grid spacing of 10 km) simulations over selected sub-domains, which will provide additional information related to the complex terrain of the region. The assessment of the role of significant but previously not resolved topographical features and land-use patterns will be provided in these experiments as well as the evaluation of the sensitivity of the simulations to the choice and size of the model domain. Moreover, development of new features in the parameterization of high resolution physics in the models is expected (e.g. cloud microphysics, chemistry of urban areas etc.). This will provide a connection with the EC FP6 Project QUANTIFY, which aims at quantifying the impact of transportation on climate change. Our project will also provide insights on the validation and relative merits of statistical and dynamical downscaling, in particular as applied to provide local climate information. The main goal of the proposal is to integrate results from different previous and ongoing modelling activities and approaches to provide the basis for very high resolution climate change impact and vulnerability assessment in important human activity sectors and natural ecosystems. It is prohibitive to cover within the STREP all the sectors in their complexity, so that we target our analysis on some key areas of specific interest to the region. For example, the flood and drought conditions which occurred in recent summers over the region highlight the importance of the hydrologic cycle and water management in the Elbe and Danube river catchments in response to changes in the occurrence of precipitation extremes. Impacts on agriculture and forestry influencing the economy of countries in the region will be studied with emphasis on the main productions in the area. The 2003 heat wave demonstrated the importance of studies of the health impacts of extreme conditions that would also lead to considerable changes in air quality, both regionally and in major urban centres. "Modelling the Impact of Climate Extremes (MICE)"
"Statistical and regional dynamical downscaling of extremes for European regions (STARDEX)". The CECILIA proposal addresses directly and to the maximum extent enabled by the instrument prescribed the call for Specific Targeted Research Projects in the topic I.3.2 "Climate changes in central-eastern Europe" under reaearch area 3.1.3 "Prediction of climatic change and its impacts" in part 3.1 concerning the "Impact and mechanisms of greenhouse gas emissions and atmospheric pollutants on climate, ozone depletion and carbon sinks" within FP6 Sub-Priority Area "1.1.6.3 Global Change and Ecosystems". Our proposed objectives, work plan and deliverables contribute directly to meeting the scientific, technical and social and policy objectives of this topic area, as indicated in the section below. The text of the call for the topic addressed reads: "Quantification (based on appropriate regional modelling and downscaling approaches) of specific climate change impacts in central-eastern Europe. Probable changes over the next decades to a century should be considered, including changes in weather patterns, extreme events, water resources, and associated consequences on e.g. agriculture, forestry and air pollution levels." The overall aim of this proposal is to assess the impact of climate change at the regional to local scale for the territory of central and eastern Europe with emphasis on using very high climate resolution in order to capture the effects of the complex terrain of the region. This goal will be achieved through a strategy of multiple and combined approaches, mainly using regional climate modelling and statistical downscaling methodologies. The primary tools, however, will be very high resolution RCMs run locally for targeted areas. From the viewpoint of climate change scenario production two time slices are planned, next decades simulation (2020-2050) and end of century simulation (2070-2100). Following the objectives presented in B.1.2, changes in weather patterns and extreme events are addressed within this proposal as they affect the most important sectors for the economies and welfare of individual countries in the region. The flood and drought conditions which occurred in recent summers over the region highlight the importance of the hydrologic cycle and water management in the Elbe and Danube river catchements in response to changes in the occurrence of precipitation extremes. The 2003 heat wave demonstrated the importance of studies of the health impacts of extreme conditions that would also lead to considerable changes in air quality, both regionally and in major urban centres. Impacts on agriculture and forestry influencing the economy of countries in the region will be studied with emphasis on the main productions in the area. With these objectives the CECILIA proposal supports well the general ideas of the area 3.1 "Impact and mechanisms of greenhouse gas emissions and atmospheric pollutants on climate, ozone depletion and carbon sinks" area. Model systems used in project ENSEMBLES project will be used here to describe the impact of greenhouse gas emissions and atmospheric pollutants on climate change processes, and the local effects of climate change on pollutants an related health impacts. Therefore, the proposal CECILIA meets the objectives of the call in sub-area 3.1.3. "Prediction of climatic change and its impacts". Uncertainties in climate changes and associated impacts will be evaluated by comparing results with those from previous projects (PRUDENCE, ENSEMBLES). The exploitation of the results will be maximised by linking the CECILIA outputs to selected applications, including water resources and water management, agriculture, forestry, air quality and health. In addition, CECILIA will improve the access of central and eastern European researchers to information and facilities for climate change research by providing an efficient use and access to the results of previous EC projects. Thus, CECILIA will integrate world leading European expertise in regional climate modelling with high resolution impact studies to provide new policy relevant information on climate change and its interactions with society at the regional scale. It will also feed into appropriate adaptation and mitigation response strategies in targeted areas. Global Circulation Models (GCMs) can reproduce reasonably well climate features on large scales (global and continental), but their accuracy decreases when proceeding from continental to regional and local scales because of the lack of resolution (Gates et al., 1996). This is especially true for surface fields, such as precipitation and surface air temperature, which are critically affected by topography and land use. However, in many applications, particularly related to the assessment of climate-change impacts, the information on surface climate change at regional to local scale is fundamental. To bridge the gap between the climate information provided by GCMs and that needed in impact studies, several approaches have been developed, commonly called downscaling or regionalization techniques (Giorgi and Mearns, 1991; Giorgi et al. 2001). The most popular approaches are (i) statistical downscaling, i.e., identification of statistical relationships between large-scale fields and local surface climate elements, and (ii) dynamical downscaling, i.e., nesting of a fine scale limited area model (or Regional Climate Model, RCM) within the GCM. The latter approach is more correct from a physical point of view, but is much more demanding on computer resources. Comparisons of statistical and dynamical downscaling indicate a similar skill of the two methods in simulating present day climate, but often quite different in simulations of the regional climate change signal (Kidson and Thompson, 1998; Murphy, 1999; Mearns et al. 1999; Busuioc et al. 2005). Another way to increase resolution is to use GCM with a variable horizontal resolution (Déqué and Piedelievre, 1995; Déqué et al., 1998), an approach that however requires even larger computational resources than RCMs. The availability of different methodologies giving often different results implies that a full assessment of the uncertainties in regional climate change simulation may require the use of multiple techniques (as proposed in this project). In the region of central and eastern Europe the need for high resolution studies is particularly important. This region is characterized by the northern flanks of the Alps, the long arc of the Carpathians, and smaller mountain chains and highlands in the Czech Republic, Slovakia, Romania and Bulgaria that significantly affect the local climate conditions. A resolution sufficient to capture the effects of these topographical and associated land-use features is necessary as illustrated in Fig. 1, where comparison of topography representation for ENSEMBLES resolutions 50 and 25 km to proposed CECILIA resolution of 10 km is presented in the detailed view on the Czech Republic. One of the commonly used RCM in the targeted regions is the model RegCM distributed freely from ICTP. The model was originally developed by Giorgi et al. (1993a,b) and then has undergone a number of improvements described in Giorgi et al. (1999), Pal et al. (2000) and, finally, Pal et al. (2005). The dynamical core of the RegCM is equivalent to the hydrostatic version of the NCAR/Pennsylvania State University mesoscale model MM5. Surface processes are represented via the Biosphere-Atmosphere Transfer Scheme (BATS) and boundary layer physics is formulated following a non-local vertical diffusion scheme (Giorgi et al. 1993a). Resolvable scale precipitation is represented via the scheme of Pal et al. (2000), which includes a prognostic equation for cloud water and allows for fractional grid box cloudiness, accretion and re-evaporation of falling precipitation. Convective precipitation is represented using a mass flux convective scheme (Giorgi et al. 1993b) while radiative transfer is computed using the radiation package of the NCAR Community Climate Model, version CCM3 (Giorgi et al. 1999). This scheme describes the effect of different greenhouse gases, cloud water, cloud ice and atmospheric aerosols. Cloud radiation is calculated in terms of cloud fractional cover and cloud water content, and the fraction of cloud ice is diagnosed by the scheme as a function of temperature. Another RCM has been used recently, starting from an operational NWP model used in several national meteorological services in the targeted domain. This is the ALADIN-CLIMATE model and first experiences from its development can be found in Huth et al. (2003). Originally, the limitedarea prediction model ALADIN has been developed by the international team headed by Météo- France and modification for RCM purposes started in 2001 in cooperation with CHMI in Prague. ALADIN is a fully three-dimensional baroclinic system of primitive equations using a two-timelevel semi-Lagrangian semi-implicit numerical integration scheme and digital filter initialisation. For the description of the model and its parameterizations, refer e.g. to Bubnová et al. (1994) and Vána (1998). The physical parameterizations package comprises gravity wave drag parameterization, implicit horizontal diffusion computed in spectral space (fourth order and increasing with height), vertical diffusion and planetary boundary layer parameterization, constant analyzed sea surface temperature and amount of sea-ice, an improved version of the ISBA (Interaction Soil Biosphere Atmosphere) scheme, including an explicit parameterization of soil freezing (prognostic variables in ISBA: surface temperature, mean soil temperature, interception water content, superficial soil water content, total liquid soil water content, total frozen soil water content), simple parameterization of snow cover, soil characteristics (texture, depth) that are pointdependent, vegetation characteristics that are point- and month-dependent, simplified radiation scheme called at every time step, mass flux convection scheme including the entrainment profile, specific humidity as a solely prognostic variable: no storage of condensate; evaporation of falling rain; treatment of the ice-phase, and a sophisticated diagnostic cloud (and cloud content) method used for radiative transfer calculations. For running the ALADIN model in a climate mode, a few modifications had to be made, which include mainly changes in lower boundary condition specifications and availability of restart. Figure 1. Detail of topographical features seen in ENSEMBLES' 50 km resolution (upper left) and 25 km (upper right) and 10 km for CECILIA proposal (bottom panel). Statistical downscaling (SDS) is an alternative approach to dynamical downscaling, i.e., regional climate modelling (e.g., Giorgi et al. 2001). The few studies having compared the two approaches indicate they operate with a comparable performance (Kidson and Thompson 1998; Murphy 1999; Wilby et al. 2000; Oshima et al. 2002; Busuioc et al. 2005). The advantages of SDS models consist, among others, in their rather modest computer requirements and portability. SDS essentially consists of seeking statistical relationships between the variables simulated well by GCMs (predictors) and the surface climate variables of interest (predictands). These relationships are usually trained on observed data (frequently represented by reanalyses), and then applied to the control and perturbed GCM outputs, the former serving for verification and the latter for climate change scenario construction. For a SDS method to be applied correctly, several assumptions must be met; the most important ones being the stationarity of the predictor-predictand relationship, the capacity of the driving GCM to simulate the predictor, and large enough variance of the predictand being explained by the predictor. The verification of these assumptions must be an integral part of any downscaling study. As for the methods, the majority of SDS studies employ linear methods, most notably multiple linear regression (MLR) and canonical correlation analysis (CCA). Nonlinear methods have recently begun to emerge, being represented mainly by artificial neural networks (ANNs) (e.g., Crane and Hewitson 1998; Wilby et al. 1998; Weichert and Bürger 1998; Cavazos 2000; Mpelasoka et al. 2001; Schoof and Pryor 2001). Other nonlinear techniques include local models in reconstructed phase space (Miksovský and Raidl 2005). An additional option is touse simple analogues methods, which sometimes can outperform several more complex approaches (Zorita and von Storch 1999). RCMs even at very high resolutions of less than 20 km do not provide site-specific information which is required in many impact models. The discrepancy between the local scale required in impact studies and the regional scale provided by RCMs becomes relevant especially in regions with complex topographical features, which are typical of the focal area of this project. Examples of such areas include mountains (e.g., the Alps, Carpathians), complex coast lines (e.g., Greece), and lakerich areas (parts of Poland). Therefore, it appears necessary to locally downscale also the RCM outputs over the target sites. Methods for localization of climate model outputs have recently been proposed and developed for the extremely complex area of Scandinavia by Benestad (2004, 2005). They are based on regression against geographical variables, such as latitude, longitude, altitude, slope, distance from the coastline, with the regression residuals being interpolated using geostatistical methods. An alternative procedure is to use a MOS-like approach, using the variables simulated by a model (here, by a RCM) as predictors (Widmann et al. 2003). In most studies, simulated time series are verified against observations in terms of distance measures such as root-mean-square error and correlation coefficient, and in terms of the first two statistical moments, i.e., mean and standard deviation. To verify the correspondence of patterns in terms of standard statistical measures (correlation, standard deviation, rms difference), Taylor diagrams are employed (Taylor 2001). These are, however, only a few of possible criteria. In various impact sectors, other criteria may appear relevant; e.g. accuracy of the time structure in crop growth modelling, and of spatial structure in hydrological modelling. In spite of it, not much has so far been done in such an enhanced validation of climate models. The few studies employing a more complex validation strategies include autocorrelations (Buishand and Beersma 1993; Mearns et al. 1995; Kalvová and Nemesová 1998; Huth et al. 2001), the occurrence of prolonged extreme events, such as heat / cold waves and dry / wet spells (Trigo and Palutikof 1999; Huth et al. 2000, 2001; Busuioc and von Storch 2003), higher-order statistical moments (Huth et al. 2003), spatial structure (Solman and Nuñez 1999; Easterling 1999; Huth 2002), trends and reproduction of contrasting climatic states (von Storch 1993; Busuioc et al. 2001, 2005; Lucarini and Russell 2002; Braganza et al. 2004; Giorgi et al. 2004), and relationships among variables (Groisman et al. 2000; Murphy 2000; Wilby and Wigley 2000), including connections between the spatial patterns of predictors and predictands (Busuioc et al. 2001, 2005). Climate change estimates based on SDS methods have been shown to be sensitive to methodological options and choices; therefore, in order that the climate change scenarios derived by SDS method be sound, the validation based on recent trends is extremely important (Busuioc et al. 2001; Huth 2004). High-resolution (both in space and time) weather data representing present and changed climate conditions are required in climate change impact studies. The set of weather variables and their spatial and temporal resolution may differ for various systems studied. For example, the crop growth models used in estimating impacts of climate change and climate variability on crop production (Semenov and Porter 1995, Mearns et al. 1997, Zalud and Dubrovský 2002) typically require single site daily series of extreme temperatures, precipitation and solar radiation. The WOFOST crop growth model (Supit et al. 1994) also requires humidity and wind speed. On the other hand, the hydrological models, which simulate the runoff regimes over larger areas often require weather data from more sites. Climate change scenarios represent differences (or ratios) in individual climatic characteristics between the future climate and the current (control) climate, usually as simulated by a climate model (Houghton et al. 2001), which is commonly a GCM but may also be a RCM (Mearns et al. 1997; Giorgi et al. 2004). Alternatively, pattern-scaling techniques can be used (Santer et al. 1990; Dubrovský et al. 2005): the standardised scenario, which relates responses of climatic characteristics to the 1 ºC rise in the global mean temperature, is multiplied by the prognosed change in the global mean temperature (?TG). The standardised scenarios are determined from the simulated time series using regression techniques. Changes in ?TG for selected emission scenarios and climate sensitivities may be estimated by other means than GCM, e.g. by simple climate models (MAGICC, Harvey et al. 1997; Hulme et al. 2000). From the climate change scenario, two techniques are typically used to construct the weather series representing the changed climate (Dubrovský et al. 2000): (i) observed weather series are modified (additively or multiplicatively) by the scenario parameters (e.g. Maytín et al. 1995; Mearns et al. 1992), (ii) weather series are produced by weather generators whose parameters were modified according to the scenario (e.g. Dubrovský et al. 2000; Riha et al. 1996; Semenov and Barrow 1997). Alternatively, direct outputs from SDS models may be used. The GCM based climate change scenarios are characterized by many uncertainties (Houghton et al. 2001, chapter 13.5), which contribute to the overall uncertainty by various amounts. Giorgi and Francisco (2000) compared various sources of uncertainties and found that the dominant source of uncertainty in the simulation of average regional climate change is the inter-model variability, with the inter-emission-scenario and internal model variability playing secondary roles. To account for these uncertainties, it is widely recommended (e.g. Houghton et al. 2001, Hulme et al. 2002) and adopted (e.g. Alexandrov and Hoogenboom 2000) to use multiple scenarios in climate change impact studies. This is typically done by using a set of scenarios derived from several GCMs and various emission scenarios. Uncertainties in climate change scenarios for the Czech Republic were analysed by Dubrovský et al. (2005). In the summer of 2002 the Czech Republic experienced some of its worst floods in history. For example, the Vltava river inundated Prague causing severe and widespread damage. In the same year, the Elbe and Danube rivers experienced their worst flooding in over a century (Waple and Lawrimore 2003). On the other hand, in the summer of 2003, central Europe was struck by an unprecedented heat wave and severe drought conditions (Schär et al. 2004, Luterbacher et al. 2004, Andersen et al. 2005) causing both human losses, extensive limitation of human activities and damages to natural ecosystems (e.g. Schär and Jendritzky 2004). Several studies suggest that a more frequent occurrence of very extreme events is consistent with climate-change predictions (Christensen and Christensen 2003, Schär et al. 2004, Meehl et al. 2004, Meehl and Tebaldi 2004, Pal et al. 2004). Central and Eastern Europe appears particularly vulnerable with regard to future changes in extremes (Christensen and Christensen 2003, Schär et al. 2004), likely due to regional specificities such as highly varying topography and continentality. Despite the relative agreement of climate-change scenarios concerning the changes in extremes over this region, a significant uncertainty remains with regard to their exact magnitude and the attribution of the causes for these changes (e.g. Frei et al. 2005). Some studies have highlighted the role of large-scale circulation changes (e.g. Meehl and Tebaldi 2004, Pal et al. 2004, Findell and Delworth 2005), but land-atmosphere interactions are clearly of key relevance as well (e.g. Seneviratne et al. 2002, Vidale et al. 2005, Lenderink et al. 2005, Rowell et al. 2005). Moreover, certain aspects central to this issue are often not well represented in GCMs (land surface heterogeneity, complex topography, convection), or even in RCMs. Very high-resolution simulations could help investigating some of these open questions and yield more accurate estimates of future changes in extreme weather events over the targeted regions. Other issues that need investigation are the effects of domain size on the simulated processes, choice of parameterizations and boundary conditions. As water is fundamental to human life and many activities, the implications of climate change for the hydrological cycle, water resources and their management are very important. Since the beginnings of concern over the possible consequences of global warming, it has been widely recognized that changes in the cycling of water between land, sea, and air could have very significant impacts across many sectors of the economy, society, and the environment. Consequently, many studies concerning the potential effects of climate change on hydrology (focusing on water cycle) and water resources (focusing on human and environmental use of water) have been elaborated. The majority of these studies are concentrated on possible changes in the water balance or in stream flow through the year. The impacts of climate change on hydrology usually are estimated by defining scenarios for changes in climatic inputs to a hydrological model, from the output of general circulation models (GCMs). Considerable effort has been expended on developing improved hydrological models for estimating the effects of climate change. Improved models have been developed to simulate water quantity and quality, with a focus on realistic representation of the physical processes involved. These models often have been developed to be of general applicability, with no locally calibrated parameters, and are increasingly using remote sensing data as input. The different hydrological models can give different values of streamflow for a given input (as shown, for example, by Boorman and Sefton, 1997; Arnell, 1999a), the greatest uncertainties in the effects of climate on streamflow arise from uncertainties in climate change scenarios, as long as a conceptually sound hydrological model is used. The climate change has potential effects on the components of the water balance (precipitation, evaporation, soil moisture, groundwater recharge and river flows) and their variability over time. The precipitation is the most important factor of variability in the water balance over space and time, and changes in precipitation have very important implications for hydrology and water resources. In a river basin the hydrological variability over time, is influenced by variations in precipitation over daily, seasonal, annual, and decadal time scales. Flood frequency is affected by changes in the yearto- year variability in precipitation and by changes in short-term rainfall properties (Osborn et al., 2000). The frequency of low or drought flows is affected primarily by changes in the seasonal distribution of precipitation, year-to-year variability, and the occurrence of prolonged droughts. Evaporation from the land surface includes evaporation from open water, soil, shallow groundwater, and water stored on vegetation, along with transpiration through plants. Climate change has the potential to affect all of these factors-in a combined way that is not yet clearly understood- with different components of evaporation affected differently. The soil moisture contents are directly simulated by global climate models, even though over a very coarse spatial resolution, and outputs from these models give an indication of possible directions of change (Gregory et al. ,1997). The local effects of climate change on soil moisture, however, will vary not only with the degree of climate change but also with soil characteristics. Groundwater is the major source of water across much of the world, particularly in rural areas in arid and semi-arid regions, but there has been very little research on the potential effects of climate change. The greatest number of hydrological studies, into the effects of climate change, has concentrated on potential changes on streamflow. To estimate the impact of climate change on the hydrological resources, mathematical rainfall-runoff models are commonly used for the reference (pilot) basins. Moreover these basins are selected based on the assessment of the vulnerability of water resources and corresponding adaptation measures. Generally, these mathematical models can be applied both in the case of present regime (actual climate) and regimes of climate change scenarios taken from downscaled results. When taking the results of statistical downscaling techniques, the use of weather generators is required to obtain proper inputs for most hydrological models, however, in the case of very high resolution RCMs both spatial and time resolution could be satisfactory for direct input to the basin models. Usually, the interest in climate change impacts on hydrology is based on the assessment of water quality changes and availability and management of surface water resources. This implies the analysis of hydrological balance changes, nutrient (N, P) concentrations and eutrophication in a reference river network with reservoirs used for drinking water supply and recreation. Atmospheric CO2, which is the primary source of carbon for plants, is in its current concentration sub-optimal for C3 type plants (Hall, 1979) and therefore the increased content of CO2 in the air stimulates photosynthesis even though some experiments seem to suggest that the increase of the photosynthesis intensity vary during the phenological phases (e.g. Mitchell et al., 1999). AT the same time, higher ambient CO2 allows to reduce the transpiration intensity through decreased stomatal conductance, especially under higher temperatures (Bunce, 2000). This should lead to improved water use efficiency by plants (WUE) and thereby to a lower probability of water stress occurrence (Kimball, 1983). Experiments conducted in controlled environments indicate that the winter wheat growth and biomass production might increase up to 33±6% (e.g. Cure and Ackock, 1986) at doubled ambient CO2. Some studies also showed that the variability in these wheat responses to CO2 enrichment is very high (e.g. Wolf et al., 2002; Bender et al., 1999). A comprehensive review of 156 experiments (Amthor, 2001) with winter wheat that were carried out during the years 1976-2001 supports these claims. The impact of the changed weather regime brought about by the CO2 increase is referred to as "indirect effect" or "weather effect". The most important weather variables that directly determine the crop yield are solar radiation, precipitation and temperature. If no management response (e.g., other cultivars, change in the planting date or soil water conserving practices) is applied, spring barley (and all cereals in general) yields typically decrease with increasing temperature due to a shortening of phenological phases (Batts et al,. 1997; Brown and Rosenberg, 1997). On the other hand, the crop response to high temperatures clearly depends on the character of the temperature increase as well as the developmental stage of the crop (Porter and Gawith, 1999). Forest response to climate change and other pressures will alter future carbon (biomass) storage in forests, but the regional extent and direction of change is still unknown. Research reported since the early nineties confirms the view that the largest and earliest impacts induced by climate change are likely to occur in mountainous and boreal forests, where changes in weather-related disturbance regimes and nutrient cycling are primary controls on productivity (IPCC, 2001b). Forest growth has increased during the past several decades in European forests (Spiecker et al. 1996). Climate warming, increasing CO2, increased nitrogen deposition, and changes in management practices are factors that are assumed to be behind the increase. The impacts of temperature and CO2 have been shown in experiments and are extrapolated by model calculations (Keller et al., 2000, Mindas et al., 2000). There are major gaps between the actual and attainable yields of crops, attributable largely to pests, diseases and weeds (Oerke et al., 1995). In global change research, estimates of crop yields using simulation models also suffer from major gaps between observed and predicted yields (Landau, et al., 1998). Furthermore, invertebrates and plant pathogen (in this proposal term "pests" include also plant pathogens) are highly adapted to change and so are prime targets for risk assessment in global climate change. Therefore predicting the potential distribution of all pests, both indigenous and introduced, plays a key role in determining the effects of global change effects on agricultural, horticultural and forest ecosystems. Pest -host relationship can be affected by climate change in different ways. Pests that are currently of minor significance may become key species, thereby causing serious damage in European countries (IPCC, 2001a). The distribution and intensity of current key pests and diseases may be affected, leading to changed effects on yield and on control measures such as pesticides and integrated pest management. It is also apparent that pests will migrate as crops migrate (e.g. Lipa, 1999) in association with climate-induced changes in crop composition. At the same time the pesticide usage will change thus leading in some cases to an increase of production costs (Chen and McCarl, 2001). However, as it was stated in the IPCC (2001) only modest progress has been made in understanding pests response to climate change since the last comprehensive overview. It has been also noted by Rosenzweig et al. (2000) that ranges of several important crop pests in United States have expanded since the 1970s, including soybean nematode and corn gray blight. These expansions seem to be consistent with climate trends, although there are competing explanations. The IPCC (2001) report also highlights the importance of specialized model use as a tool for understanding development dynamics of various pests and diseases under changed climatic conditions (e.g. Teng et al., 1996). The atmospheric air is contaminated with pollutants that may adversely affect health. These pollutants have many sources: natural (e.g., volcanoes, forest fires and decomposition of vegetation), industrial (e.g., fossil fuel-fired electric power plants and manufacturing facilities), transportation (e.g., truck and automobile emissions), residential (e.g., home and municipal coal, gas and oil burners, wood stoves and municipal waste combustors), agricultural (e.g., ammonia, methane and pesticides), commercial (e.g., dry-cleaning operations, commercial facilities, many individually small activities such as gasoline service stations, small paint shops, consumer solvent use). People are constantly and ubiquitously exposed to air pollutants, whether indoors or outdoors. Climate change may affect exposures to air pollutants by a) affecting weather and thereby local and regional pollution concentrations (Robinson, 1989); b) affecting anthropogenic emissions, including adaptive responses involving increased fuel combustion for fossil fuel-fired power generation; c) affecting natural sources of air pollutant emissions (U.S. EPA, 1998); and d ) changing the distribution and types of airborne allergens (Bernard et al., 2001). Local weather patterns-including temperature, precipitation, clouds, atmospheric water vapor, wind speed, and wind direction- influence atmospheric chemical reactions; they can also affect atmospheric transport and deposition processes as well as the rate of pollutant export from urban and regional environments to globalscale environments. In addition, the chemical composition of the atmosphere may in turn have a feedback effect on the local climate. Weather is also associated with energy demands (e.g., for space heating and cooling) that could alter patterns of fossil fuel combustion. In particular, individual responses to extremely hot weather can result in large increases in air conditioner use. In addition, high temperatures cause increased VOC evaporative emissions when people run motor vehicles. The health effects of air pollution are broad and diverse, including dramatic episodes of increased mortality at high concentrations. In humans, the pulmonary deposition and absorption of inhaled chemicals can have direct consequences for health. Nevertheless, public health can also be indirectly affected by deposition of air pollutants in environmental media and uptake by plants and animals, resulting in chemicals entering the food chain or being present in drinking-water and thereby constituting additional sources of human exposure. Furthermore, the direct effects of air pollutants on plants, animals and soil can influence the structure and function of ecosystems, including their self-regulation ability, thereby affecting the quality of life (WHO, 2000). The most sensitive groups include children, older adults and persons with chronic heart or lung disease. A simple schematic illustrating how potential climate change affects air-pollution and health is shown in Fig. 2. Of the few studies that have attempted to quantify the potential effects of climate change on air quality, most have examined the impact of increased temperature on O3 formation (Morris et al., 1995). In general, these studies find that O3 concentrations increase as temperatures rise, although the estimated magnitude of the effect varies considerably. However, the ability of atmospheric models to simulate complex photochemical reactions in the atmosphere is limited for several reasons, including uncertainties in emission inventories and boundary conditions when we refer to regional air quality modeling. Further, several of these studies relied on assumptions for key variables such as emission levels, mixing heights, and cloudiness. Because many aspects of weather affect air quality, and most of these have been held constant in modeling studies, the results of these studies should not be considered predictions of future air quality levels associated with climate change. Rather, they demonstrate the sensitivity of atmospheric air pollutants to changes in specific meteorological variables as well as emission levels. Figure 2. 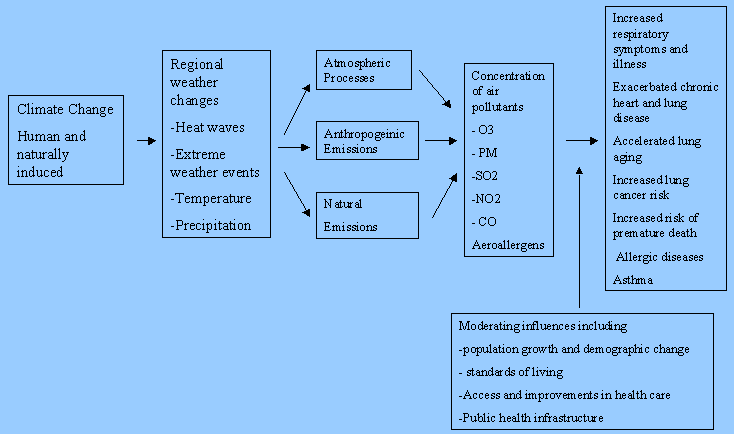 Potential climate change effects on air-pollution and health (adapted from Bernard et al., 2001). Another risk factor for human health, which goes hand in hand with the issue of air quality through the chemistry of pollutants, is the occurrence of heat waves and, to a certain extent, even cold waves. The summer of 2003 encompassed one of the most severe heat waves on record in central and western Europe causing both human losses and damage to matural ecosystems. The links between the occurrence of such extreme events and anthropogenic forcings and the consequences for human health and mortality are widely discussed by Beniston and Stephenson (2004), Schär et al. (2004), Pal et al. (2004), Meehl et al. (2004) and Meehl and Tebaldi (2004). The issue of global change is recognized and taken into account under the UN Framework on Climate Change as having potential of serious consequences for the natural environment and human societies. This is particularly the case for the EU, which has taken the lead among industrialised countries in calling for reductions in greenhouse gas emissions and establishing policies to achieve such reductions within its own borders. Although the broad response of global climate to increased greenhouse gas concentrations is well established, there remain many unknowns in the regional details of current projections of future climate change. Previous projects such as PRUDENCE and ongoing projects such as ENSEMBLES provide a significant improvement in the regionalization of climate change implications at the European scale. These projects have proven regional climate modeling to be a very useful tool to study regional climate change. Both PRUDENCE and ENSEMBLES are targeted to Europe-wide scale, where the resources are still a factor limiting the model resolution. The CECILIA proposal targets the smaller area of Central and Eastern Europe, thereby allowing a much finer resolution (10 km), which will provide in this region of complex topography and landuse a further robust test of the feasibility of dynamical downscaling for use in climate change research. Thus, the central internal objectives of CECILIA are to improve regional climate scenarios and their localization for climate impacts models, and comparing these results against the results of previous and ongoing projects to assess the added value of dynamical downscaling at very fine scales. The latter underpin the formulation of adaptation and mitigation policies. The general aim of CECILIA is to improve Europe's ability to assess the consequences of global climate change at the local scale, and on this basis to assist to formulate more precise response strategies and more scientifically based negotiating positions. The CECILIA project will provide a contribution to the improvement of the scientific basis for the implementation of policies to reduce emissions of greenhouse gases. Such an effort will assist in the successful implementation of the FCCC (Framework Convention on Climate Change) and the Kyoto Protocol, for the negotiations in the post Kyoto process and in regulations to mitigate the possible consequenses of climate change as concluded by IPCC. Very high resolution and better regional predictions are required to guide long term planning in sectors such as agriculture and energy. It will likewise contribute to define future EU standards for agricultural and energy policies. For this purposes, reliable information and results from the research community are necessary for policymakers, keeping the standards of scientific outputs on a peer reviewed basis. This proposal brings for the first time very high resolution localization of climate change scenarios into the targeted areas of central and eastern Europe, with the added value that these climate scenarios are produced locally. This will provide necessary policy relevant information for decision makers and local authorities concerning the possibility of adaptation and/or mitigation measures. Moreover, it will provide know-how and tools which can be further systematically used for the analysis of the climate change development and climate change impacts on different sectors of the society in the target region. With the emphasis on former Eastern Block countries the CECILIA project will provide new access and contacts for researchers from this area to the European research activities and thus help to bridge exisiting gaps. Another significant contribution to EU policy from the proposal CECILIA is the promotion of new massive access to climate change data and simulation within the framework of this topic for researchers from the area of the former Eastern Block. This proposal has already become a platform for spreading the contacts between climate change scientists from the targeted area and the western part of Europe and, as accepted, it will strengthen the collaboration between older countries of the EU and "newcomers" within the climate change research. In this way, it will help to bridge exisiting gaps. Climate change will affect quality of life and health through a variety of routes including changes in water resources, new or altered diseases, changes in agricultural productivity and in the profile of economic activity affecting livelihoods, changes in air quality conditions, and raised sea levels resulting in loss of land for human habitation and damage to coastal ecosystems. Although some climate-related changes may ultimately have benefits, the process of change almost always affects the communities and industrial sectors involved in a negative manner. Several key issues connected with climate change have become of interest in recent years, such as the occurrence of extremes (floods and heat waves) or effects on air quality, with potentially severe impacts on the quality of life, health and safety. The occurrence of these extreme events, in some cases causing loss of human life and extensive damages or costs, is affected by the relation between extremes and climate change. This relation can be better explored using the downscaling and high resolution (10 km) climate modeling planned in the project CECILIA. Results from CECILIA will allow us to evaluate the vulnerability of different sectors in the region, thereby providing relevant information for decision makers and local authorities for application of appropriate adaptation and /or mitigation strategies. CECILIA will provide high resolution tools to help anticipate and ameliorate the adverse impacts of climate change on humans both at the individual and at the societal level. It will also help to identify and possibly exploit positive impacts. CECILIA will provide demonstrations of the use of these tools in important economic, environmental or social sectors where the impacts of climate change are likely to be felt. Climate change represents a major factor affecting the global and European environments. Natural ecosystems will become stressed if climatic zones shift at a faster rate than the ecosystems can migrate. Changing availability of natural resources such as water supply may adversely affect the sustainability of European activites. A more stressed environment will be even more vulnerable to natural hazards, such as severe storms, droughts or flooding events, than is the situation in the present climatic conditions. CECILIA with its high resolution climate simulation tools can help anticipate and ameliorate the adverse impacts of climate change on the local environment and natural resources of the targeted regions. It can also provide mitigation information to reduce the hazards concerning these important factors. Concerning the environment, CECILIA, similarly as the EC project QUANTIFY, will provide an effective platform for reducing the gap between climate change and air quality sciences, putting together traditional aspects of climate change impacts and impacts on air quality. The CECILIA proposal is in close relation to the ongoing FP6 EC IP ENSEMBLES and QUANTIFY, with which it will share results and know how. As mentioned above, the activity covered by the proposal is linked to the topic of IPCC and results of climate change simulation generated within the CECILIA project are expected to be available for other interested institutes, universities and research centres in Europe, with the possibility of direct use in many national projects studying climate change impacts over the targeted area.